Overview: The design is based on flexibility allowing for a wide variety of activities, both planned and spontaneous. 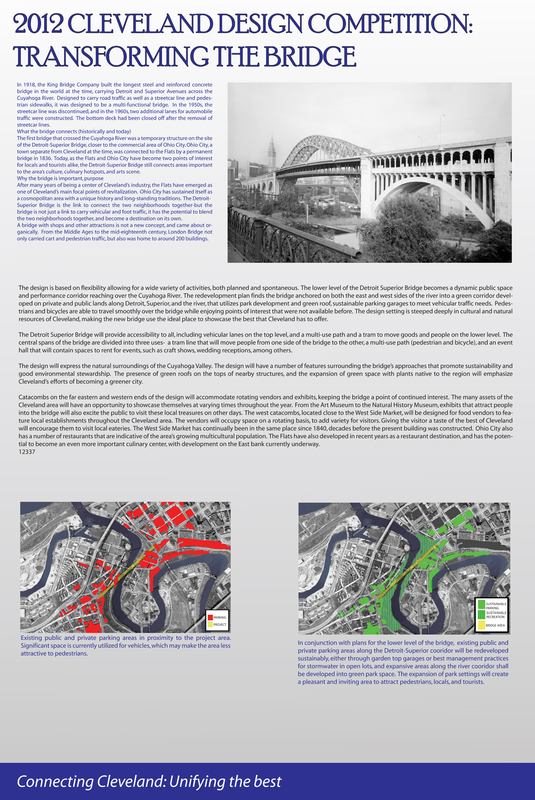 The lower level of the Detroit Superior Bridge becomes a dynamic public space and performance corridor reaching over the Cuyahoga River. The redevelopment plan finds the bridge anchored on both the east and west sides of the river into a green corridor developed on private and public lands along Detroit, Superior, and the river, that utilizes park development and green roof, sustainable parking garages to meet vehicular traffic needs. Pedestrians and bicycles are able to travel smoothly over the bridge while enjoying points of interest that were not available before. 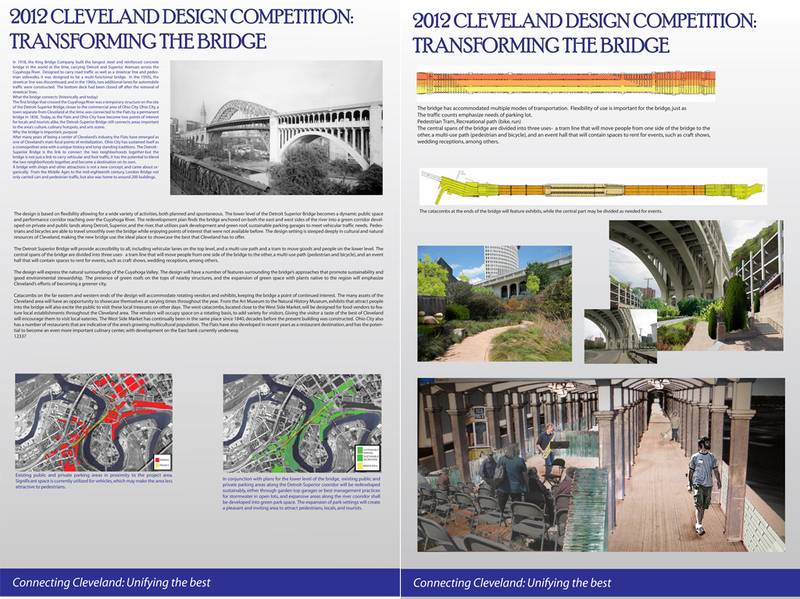 The design setting is steeped deeply in cultural and natural resources of Cleveland, making the new bridge use the ideal place to showcase the best that Cleveland has to offer. The Detroit Superior Bridge will provide accessibility to all, including vehicular lanes on the top level, and a multi-use path and a tram to move goods and people on the lower level. The central spans of the bridge are divided into three uses- a tram line that will move people from one side of the bridge to the other, a multi-use path (pedestrian and bicycle), and an event hall that will contain spaces to rent for events, such as craft shows, wedding receptions, among others. The design will express the natural surroundings of the Cuyahoga Valley. 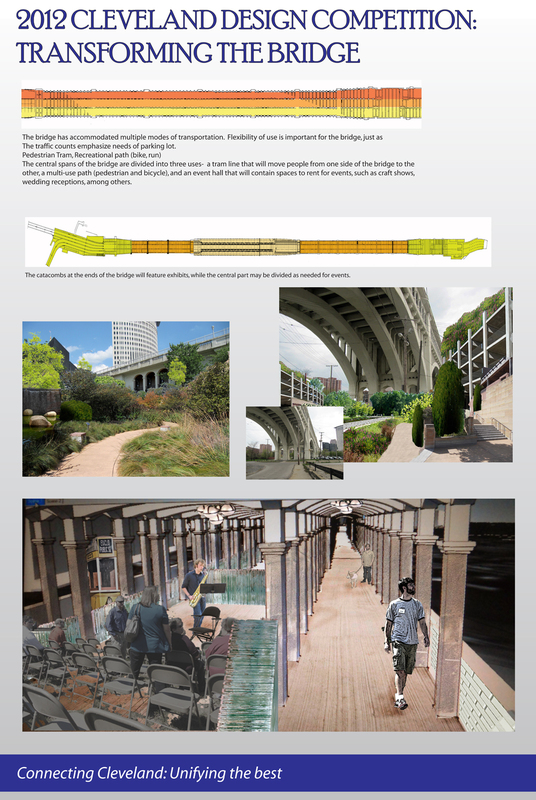 The design will have a number of features surrounding the bridge’s approaches that promote sustainability and good environmental stewardship. The presence of green roofs on the tops of nearby structures, and the expansion of green space with plants native to the region will emphasize Cleveland’s efforts of becoming a greener city. Catacombs on the far eastern and western ends of the design will accommodate rotating vendors and exhibits, keeping the bridge a point of continued interest. The many assets of the Cleveland area will have an opportunity to showcase themselves at varying times throughout the year. From the Art Museum to the Natural History Museum, exhibits that attract people into the bridge will also excite the public to visit these local treasures on other days. The west catacombs, located close to the West Side Market, will be designed for food vendors to feature local establishments throughout the Cleveland area. The vendors will occupy space on a rotating basis, to add variety for visitors. Giving the visitor a taste of the best of Cleveland will encourage them to visit local eateries. The West Side Market has continually been in the same place since 1840, decades before the present building was constructed. Ohio City also has a number of restaurants that are indicative of the area’s growing multicultural population. The Flats have also developed in recent years as a restaurant destination, and has the potential to become an even more important culinary center, with development on the East bank currently underway.